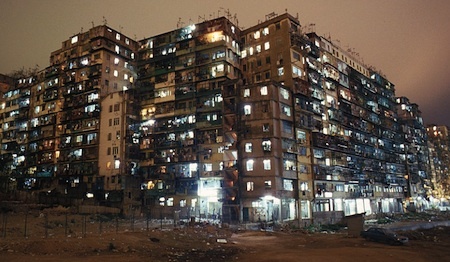 A recent story about Kowloon Walled City, which was demolished in 1993, provides remarkable photographs of an architectural "mashup". With 33,000 people and a number of businesses residing in about several hundred interconnected buildings on 6.5 acres, the entire structure was completed without any input from architects. Kowloon Walled City was a legal no-man's-land, outside the strict regulations that governed the rest of Hong Kong. During some parts of its existence, it was ruled by warlords or rival gangs. "...Some ninety million people live there, almost equally divided between the two species [human and Gowachin]. Chu is approximately eight hundred square kilometers." 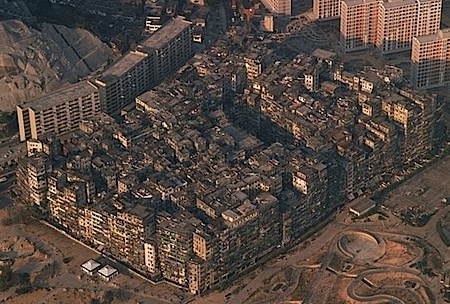 The Warrens, the most densely populated part of Chu, could have been modeled on Kowloon Walled City. All of the buildings were interconnected, with minimum width tunnels and hallways providing access. See more photographs from this unique world at the Daily Mail.